Ski Hill residences in Leavenworth are served water by Icicle Irrigation District. 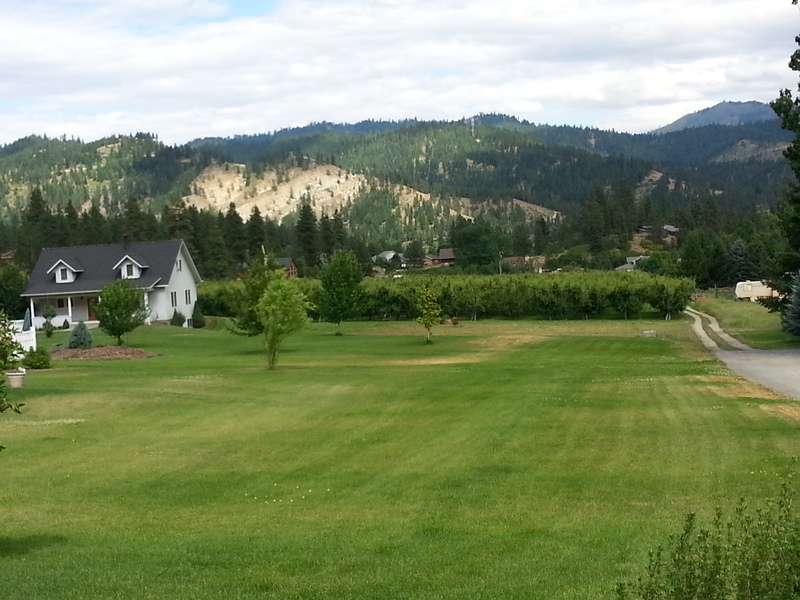 Inside Leavenworth, the District’s water is growing large and lush lawns, pears not so much. All the work will be done the old-fashioned way with picks and shovels. At Eight Mile Lake Jantzer said they should be able to clear out four or five feet, which should produce another 160 acre feet of water. Ian Dunn, Leavenworth Echo, “Icicle/Peshastin Irrigation Districts struggling to provide enough water” (Sept. 2, 2015). When the Alpine Lakes Wilderness was designated in 1976, the Icicle and Peshastin Irrigation Districts (IPID) held pre-existing rights to divert water from several of the Enchantment Lakes – and those water rights were grandfathered in. This month, however, the Irrigation Districts are taking the unprecedented step of helicoptering into the Wilderness to lower the outlets to at least two of the lakes – Eightmile and Colchuck — and take more water. 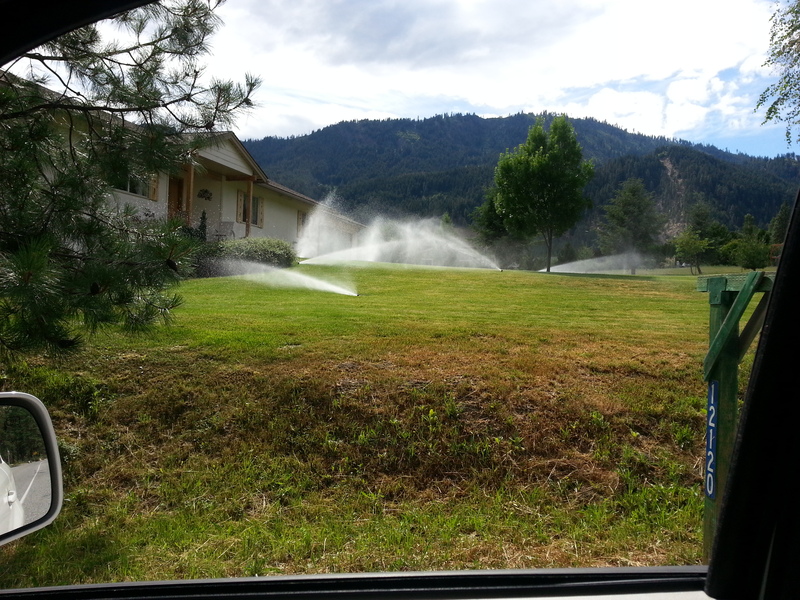 More Leavenworth lawn irrigated compliments of the Icicle Irrigation District diversions from the Enchantment Lakes. A remnant pear orchard appears in the background. This project offers multiple ironies. The largest irony is that, although the Districts do serve water to Wenatchee Valley pear growers, many orchards have been converted into residential neighborhoods as the Cities of Leavenworth and Cashmere have expanded their urban boundaries. IPID is diverting water out of the Alpine Lakes Wilderness to irrigate not just pears, but also very large expanses of lawn. Adding to the incongruities, IPID’s dismantling and de-watering of the Enchantment Lakes is up for funding by the Washington Department of Ecology’s drought-relief funding program. Ecology originally granted IPID $41,000 to install pumps into Eightmile Lake, but according to a Sept. 3 Capital Press article, the District was unable to rent helicopters of the size needed to implement that project. Ecology’s website now indicates it is considering granting $12,500 to IPID for the “pick and shovel” alternative. Thus, the public will likely be paying IPID to inflict its destruction on the Alpine Lakes Wilderness. Normally an application to take more water out of a lake would require public comment and review, and strict statutory standards to prevent harm to the environment and other water users. But Ecology’s drought relief funding rule exempts applications from public review and requires expedited decisions – within 15 days. Questions regarding IPID’s relinquishment of water rights that it has not used for “80 to 100 years” remain unanswered. Also missing in action is the U.S. Forest Service, which is tasked with managing and protecting the Alpine Lakes Wilderness. Do IPID’s easements and special use permits really allow it to tamper with these lakes? There’s a back story too. Icicle-Peshastin Irrigation District has been eyeing methods for increased access to Alpine Lakes water for some time. As described in Naiads’ February 2015 four-part series, “New Dams and Diversions for the Alpine Lakes,” IPID, Ecology, and several other public agencies formed the Icicle Work Group in order to “bargain” for more water out of the Alpine Lakes Wilderness. IPID’s canal transports water from Icicle Creek to its customers. Several miles of the canal are only partially lined, and leak enough water to support a robust but artificial riparian zone. Before resigning, CELP circulated a Water Conservation Potential Report, describing IPID’s inefficient operations and proposing alternative methods to “solve” upper Wenatchee Valley water supply problems. Chief among these is reduction of lawn irrigation in the Ski Hill residential zone. Another solution is to line IPID’s leaky canal, which as shown in the photo at right, is supporting a substantial amount of phreatophyte vegetation. Rather than take the “soft path” of water conservation, however, IPID has chosen the hard path of pick-axe and shovel. Apparently, during drought, no water resource is safe – even waters in federally protected wilderness. Categories: 2015 Drought, Icicle Creek, Instream Flows, Water Conservation, Western Water Law, Wilderness | Permalink. Mayoral water war on display. (Photo: Spokesman Review) Check out www.H2KNOW.info for a different kind of message regarding Spokane’s water. It’s hard to forget the water wars of 2011 – the mayoral water wars that is. 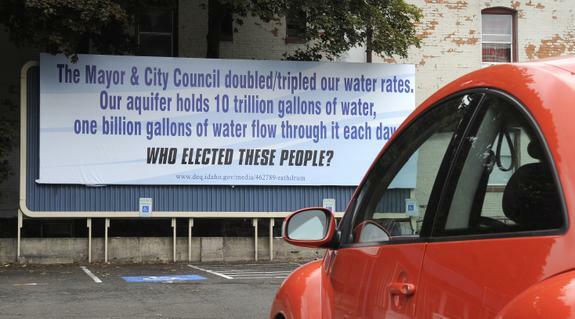 Anonymous billboards went up around town questioning why – with 10 trillion gallons of water in the Spokane-Rathdrum Aquifer – the City of Spokane would raise water rates to induce conservation. A mayor and a city council member lost their seats, due in part to this highly misleading message. Abundant groundwater notwithstanding, Mother Nature, combined with a City revenue structure that incentivizes water sales, have created a one-two punch for Spokane’s “most precious resource.” The Spokane River is flowing at near-record lows. It doesn’t have to be this way . . . but somebody in the City of Spokane needs to speak up. Spokane River flowing at 630 cfs at the Westlink Pedestrian Bridge on August 8, 2015. 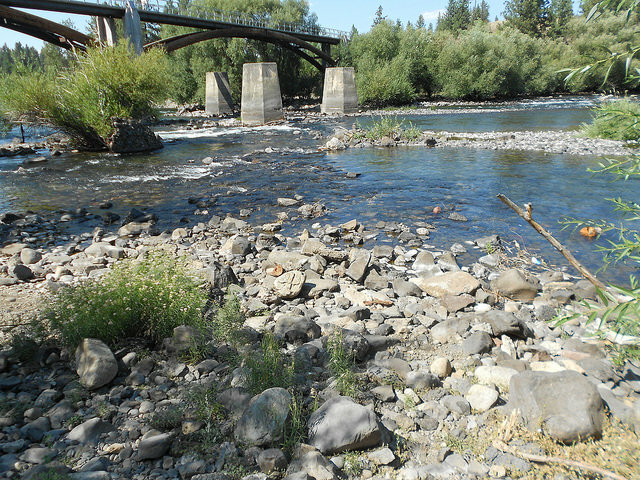 The Spokane River is directly fed by the Spokane-Rathdrum Aquifer, so groundwater pumping by all of the municipalities in this region is causing extreme low flows. For the last few days, the River has been dropping into the 550 cfs range. That’s 300 cfs below the minimum flow that the Department of Ecology adopted last February, and less than half of what the flow has been this time of year for the last few years (and a third of what it was historically). The lowest flow on record is around 450 cfs, and it seems possible that a new record may be in the offing if people don’t put the brakes on their water usage. As the City’s Water System Plan states (and common sense tells us), summer is the season of high water use. From October to April, monthly water demand averages 31 to 44 million gallons per day (mgd). May through September, the average jumps to between 64 and 114 mgd. But this year, 2015, July usage was a whopping 123 mgd. No wonder the Spokane River is suffering. The City of Spokane has failed the Spokane River by stepping back from reasonable water conservation planning and implementation. Examples of inclining block rate structures in Arizona. When a higher tier kicks in sooner and goes higher, people begin to conserve. Spokane’s rate structure would fall near the bottom of this graph. Water rates. A “conservation rate structure” is the most effective way to get water customers to pay attention to and cut back on their water use. The pocket book speaks. The basic idea – the more you use the higher your rate – creates an incentive to drop your water usage into a lower/cheaper tier. But Spokane’s rates make very minor distinctions for higher usage – and are ineffective in encouraging Spokane citizens to turn the outdoor spigot and sprinklers down (or off). For example, Spokane residential customers can use “6 units” of water (about 4,500 gallons) for 28 cents/unit or $1.71. The next “4 units” (about 3,000) gallons costs 60 cents/unit or a total of $2.41. The next jump is to 81 cents per unit. A household can use 15,000 gallons per month (500 gallons per day) – a large amount – for just $12 per month. These are not conservation-inducing water rates. Conservation Goals. Washington law requires water purveyors to adopt water conservation goals. The City’s goal is to reduce water usage by 2% each year. It is a modest goal, but the City can’t seem to meet it (in part because the City’s water rates are so low). In 2014, the City’s summer season water usage actually exceeded the conservation goal by 13% (goal was 8.5 billion gallons, actual use was 9.6 billion gallons). According to the City’s 2014 Drinking Water Report, the reason the City did not meet its goals was usage by commercial/industrial users. Clearly, this is an area where higher water rates could have a meaningful impact. Water Leakage. The City is losing a lot of water out of its “World Water II era” water mains. The Drinking Water Report cites 17.8% leakage in 2014. The state’s water efficiency law, adopted in 2003, requires a cities to control water leakage to a rate of 10% or less. Twelve years and counting, many wonder when Spokane will get around to compliance. City Conservation Plan. The City, by law, must adopt a water conservation plan every six years. 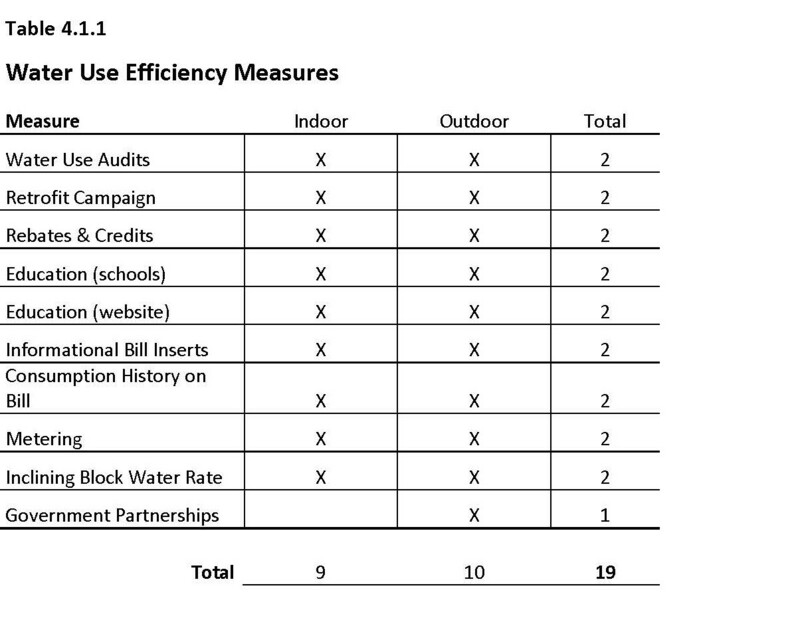 The latest plan, a December 2014 draft, identifies 19 measures (table at right). These include water audits, low flow appliance rebates, education, and etc. Some measures are not being implemented and some don’t even make sense. Non-profit groups Sierra Club Upper Columbia River Group and the Center for Environmental Law & Policy have taken leadership to encourage residents of Spokane to cut their water usage. The H2KNOW campaign has billboards up and is getting media coverage. Visit the H2KNOW.info website and Facebook page and see if you can translate a few tips on water reduction into your daily life. Categories: 2015 Drought, H2KNOW Campaign, Instream Flows, Spokane River, Water Conservation, Water Economics | Permalink. On July 31, 2015 the City of Spokane filed a legal complaint against mega-chemical manufacturer Monsanto and associated corporations, claiming the chemical manufacturing giant has engaged in nuisance, negligence, and product liability. 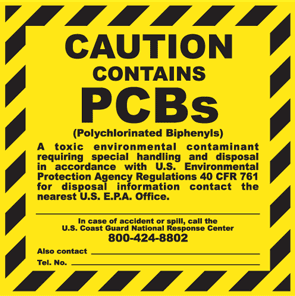 The complaint describes the destructive nature of PCB pollution, and alleges Monsanto knew decades ago that it was manufacturing and distributing a chemical that was not fit for use, the dangers of which it failed to provide notice to its customers. That federal case is Sierra Club & CELP v. U.S. Environmental Protection Agency. On March 16, 2015, U.S. District Court Judge Barbara Rothstein ruled that EPA had abused its discretion in failing to require a PCB clean-up plan for the Spokane River, and ordered EPA to file with the court by July 14 a schedule for adopting that plan. For more info, see our previous post: Federal Court Rules: Evict Fox from Chicken Coop. The City is correct. The court-mandated PCB TMDL will establish waste load allocations that will be translated into limits on the amount of PCBs the City can discharge into the Spokane River via its treatment plant, stormwater system, and Combined-Sewer Overflow (CSO) system. Spokane is one among several polluters who will be required to substantially upgrade treatment facilities to remove PCBs from effluent before it is discharged to the Spokane River, thanks to the Sierra Club/CELP legal action. Other affected polluters include the new Spokane County treatment plant, Liberty Lake Water & Sewer, Kaiser Aluminum, and Inland Empire Paper. The City’s lawsuit is one of four such suits to be filed against Monsanto in the last few months. Other municipal plaintiffs seeking damages for harm to the environment include San Jose, CA, San Diego, CA, and the Port of San Diego. There have been winners and losers so far in the Monsanto PCB liability lottery, including reported settlements for PCB dumping in South Wales, England, and for personal injuries to former employees and others harmed by Monsanto’s Anniston, Alabama manufacturing facility. However, last month a jury returned a verdict in Monsanto’s favor in a St. Louis, Missouri lawsuit brought by individual’s claiming harm from PCB exposure. In March 2015, the newsblog ThinkProgress, reporting on San Diego’s lawsuit, described the difficulties of suing companies for historic pollution practices. Sadly, it’s much harder to prove liability when the “scene of the crime” is a public resource like a river or a bay. Suing over historic pollution is not a new concept for the Spokane watershed, however, given our history with massive silver and lead mining pollution in the Coeur d’Alene Basin, and the Midnite Mine uranium Superfund site on the Spokane Indian Reservation, not to mention Teck Cominco’s discharge of 9 million tons of toxic slag into the Lake Roosevelt. Usually it is Native American Tribes and conservation groups engaged in the battles to clean up public resources like the Spokane River. Welcome to the club, City of Spokane. 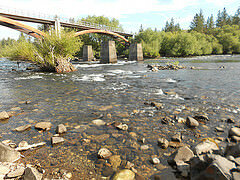 Categories: PCBs, Spokane River, Water Pollution, Water Quality Standards | Permalink. The aerial map at top shows the location of a Nooksack Nine diverter (red dot). The photo shows the diversion device. A comparison of GPS coordinates reveals that, on June 24, 2015, Ecology issued Water Right No. S1-28777 for this diversion location to Sherman Polinder. 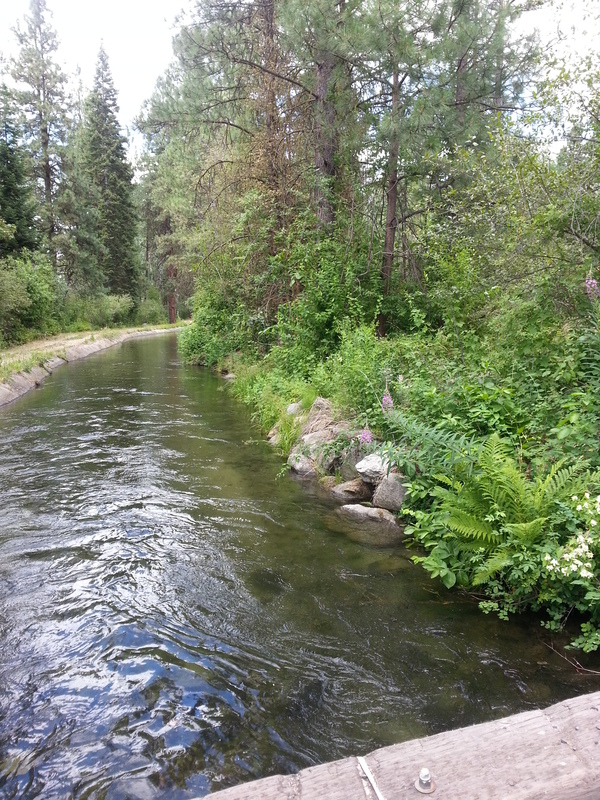 Under the terms of the permit, Polinder is prohibited from diverting when Nooksack River flows are below their minimums, as was the case when the photo was taken. On June 24 and 26 Ecology made good on a bad idea and issued water rights allowing the Nooksack Nine to divert water. These rights are, of course, interruptible. The permittees may use water only when the Nooksack River is meeting its regulatory instream flows. And because the Nooksack doesn’t meet those flows 50-80% of the time during summer months, these new water rights don’t provide much water. 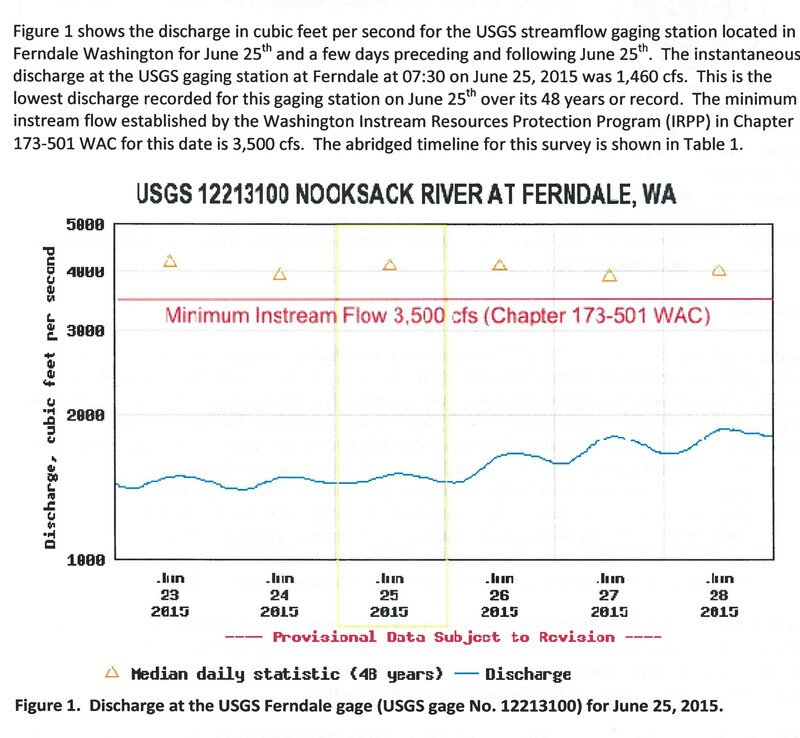 June 2015 flows in the Nooksack River (blue line) are well below the instream flow rule – which requires post-1976 water users to curtail their use. The Nooksack River – like virtually every other river in Washington this year – is way, way below it’s normal flows. 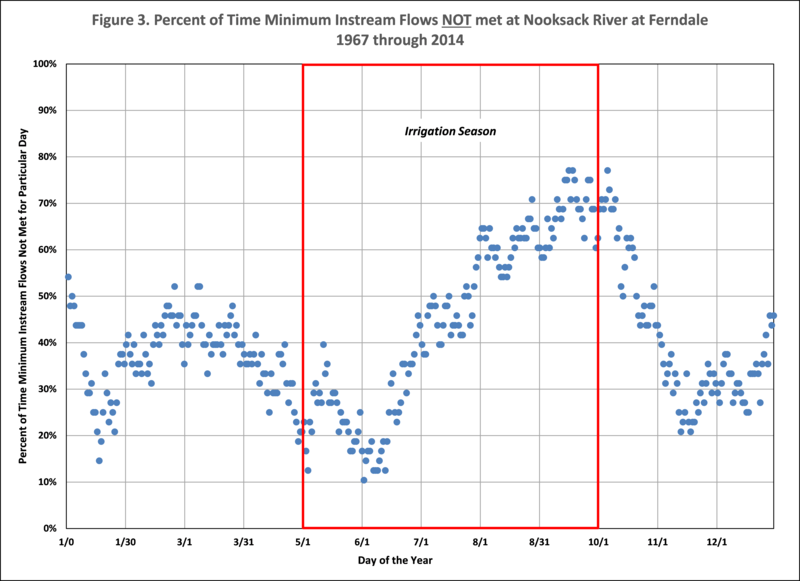 The graph at right indicates the Nooksack is at the lowest levels ever recorded for this time of year. So anyone with a water right issued after 1985 should not be diverting at all. 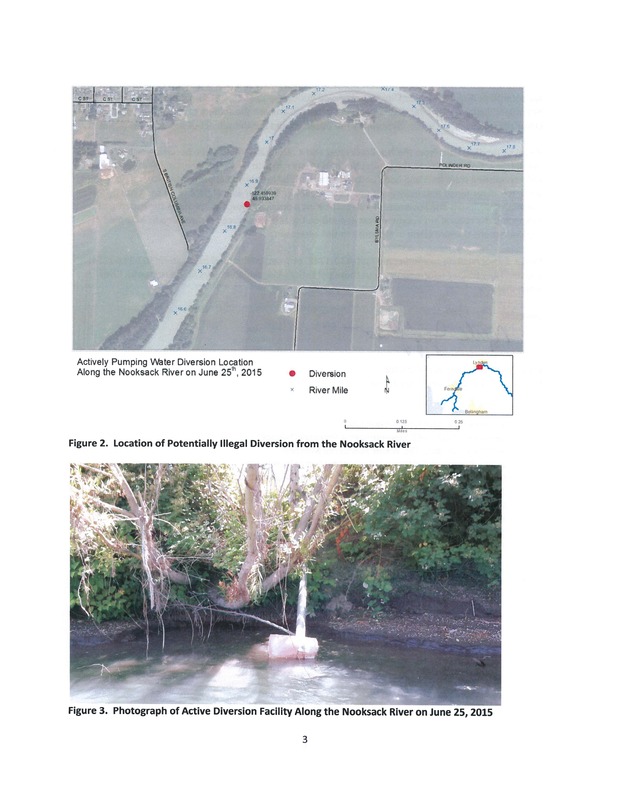 On June 25 and 30, 2015, Lummi Nation staff again floated the Nooksack River and identified 39 potential illegal diversions. And guess who was diverting? That’s right – seven of the Nooksack Nine diverters were taking water out of the river – in violation of their brand-new rights. Never mind that Ecology promised that enforcing these new permits would be their “number one priority.” Never mind that Lummi Nation and CELP asked Ecology to not issue the permits in the first place. Never mind that this sets a terrible precedent for hundreds of other illegal water users in the Nooksack basin. The aerial map at top shows the location of a Nooksack Nine diverter (red dot). The photo shows the diversion device. A comparison of GPS coordinates reveals that, on June 24, 2015, Ecology issued Water Right No. S1-28775 for this diversion location to Ed & Dale Blok. Under the terms of the permit, the Bloks are prohibited from diverting when Nooksack River flows are below their minimums, as was the case when the photo was taken. Illegal water diversions from the Nooksack River and its tributaries have been occurring far too long, to the detriment of salmon and the Lummi Nation’s treaty rights to harvest. We expect that Ecology will enforce existing state laws and issue both cease and desist orders and appropriate monetary penalties when it is determined that individuals are diverting water without a legal right to do so. Ecology should not allow individuals and business to illegally divert a public resource for profit at the expense of others and the natural environment that depend on the same resource. And we would add – Ecology claims that its enforcement authority is limited to a “step-wise compliance process” and that it cannot issue enforcement orders and penalties without first “working with” the violator. This is wrong. The law is clear. No one has a right to take public waters without a permit, or without being in compliance with their permit. Ecology’s handholding with unauthorized water users is incorrect as a matter of law and unsound as a matter of public policy. In point of fact, Ecology should shut down the diverters and fine them $5,000 per day for each day of illegal water diversion. Indeed, the unauthorized use of water is a criminal misdemeanor, the local water master has the power to arrest water code violaters, and the local prosecuting attorney has the duty to assist. Nooksack River water thievery is illuminating the Department of Ecology’s inability and unwillingness to uphold the law and to protect water resources that the state holds in public trust for the common good. In a year of drought, this really matters. Is any elected, appointed or employed official with the State of Washington listening? This is the third in a series of articles on Whatcom Water Insanity. Part 1 examines water stealing by the City of Lynden. Part 2 tells “The Tale of the Nooksack Nine.” Jean Melious’ blog, Get Whatcom Planning, also provides great info about Whatcom County water woes. Photos and graphics above are courtesy of the Lummi Nation. Categories: 2015 Drought, Instream Flows, Nooksack River, Salmon, Whatcom | Permalink. You’d have to be a hermit to be unaware that Washington state is having a bad water year. The winter of 2014-15 was very warm — 5 degrees F warmer than average. It rained plenty, but snowed little. And what snow there was is now mostly gone. Spring runoff for most rivers came weeks if not months early, and rivers are now flowing at levels we’d expect to see in mid-summer. Rivers need snowmelt to sustain flows throughout the summer. Unless it rains, hot weather will cause an increase in water temperatures in streams and rivers. Combined with low flows, river conditions will be hostile to salmon and trout species that need cold, abundant water to migrate and complete their life cycles. And, it probably won’t rain. El Niño, the ocean-warming phenomenon that drives weather patterns, is present in the North Pacific. NOAA scientists are observing high sea surface temperatures – unusual for this time of year – and predicting an 80% chance that El Nino will last through the end of the year. The bottom line: Washington state is in the midst of a very serious drought. And, there’s potential it will become a multi-year drought — similar to California. Given all this, questions come to mind about water management in Washington state. In some communities, it appears we neither recognize the dangers nor are responding in a logical fashion to the risks at hand. One way or another, money appears to be a predominant factor in drought response. Question: Why is it there is a major focus on getting emergency water supplies to farmers (especially in the Yakima River basin), but municipalities such as Seattle, Tacoma and Spokane are either messaging “everything’s okay” or just not saying anything at all? Short Answer: Summer is the big revenue season for municipal water suppliers (primarily because of residential outdoor irrigation). Water purveyors do not want to signal that their customers should conserve because it will result in reduced revenue and hurt their bottom line. Regrettably, rivers will be seriously harmed because of this ‘no-conserve’ message, which is being disseminated not just by the purveyors but also by the Dept of Ecology and the Governor’s office. Question: Why did “junior” water users in the Yakima basin plant cherry and apple orchards and other perennial crops, even though they were fully aware they would have limited access to water during a drought? Short Answer: Water users who hold “junior” or “interruptible” water rights are on notice that in a water-short year, their water supply will be cut. When farmers with junior rights plant crops that cannot survive without regular irrigation, they are making an investment decision that involves substantial economic risk. In reality, junior water right holders have been betting on a bail-out. Per next item, they appear to be getting one. The Department of Ecology will spend millions of dollars to subsidize farmers who made bad choices about crop plantings, but only $25,000 on “conservation education. From Dept. of Ecology 2015 Drought website. Question: Why is the state spending millions of dollars in public subsidies for water mitigation for orchardists who are now destroying last year’s apple crops? Short Answer: Washington farmers are destroying large amounts of last year’s apple crop that they were unable to sell. They blame the inability to ship to international destinations due to port slowdowns, but last year saw record apple over-production. What are the chances that Washington state will subsidize apple crops this year that will be destroyed next year? Indeed, the Department of Ecology is spending millions of dollars to underwrite drought leasing programs and emergency well use in the Walla Walla and Yakima River basins for agricultural users who hold junior water rights. Washington’s Office of the Columbia River has spent nearly $200 million on water supply projects over the past 8 years, but very little of it has been directed toward water scarcity and drought response. Instead, OCR has function more like the Office of Cadillac Desert, studying dams and other irrigation projects that, if built, will ultimately cost taxpayers billions of dollars. Question: Given drought conditions, why is the Department of Ecology issuing new water rights in areas where water supply is likely to be deficient? Short Answer: For the last 3 years, the state legislature has included a budget proviso requiring Ecology to issue at least 500 water right decisions each year or lose a half million dollars in budget. This has converted the Water Resources Program into a permit factory. One example of the ensuing folly is the proposal to issue water permits to illegal water users in the Nooksack River basin. Agency resources for the type of water management activities critical for managing for drought have dwindled to negligible levels (e.g., metering water use, promoting water conservation, measuring available surface and ground water supplies, enforcing against illegal use). As rivers recede, the 2015 drought promises to reveal many mysteries and closeted skeletons. Who is making money off of drought? How low can our rivers go? The salmon life cycle is 2-4 years – how will the 2015 drought affect salmon returns in 2017-19? Will farms go out of business? Will farmers make more risk averse cropping decisions in the future? Inquiring minds, stay tuned. 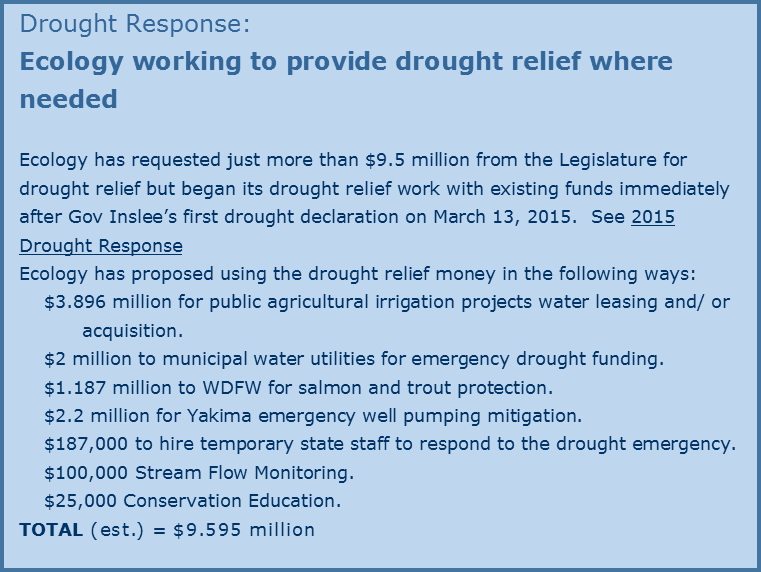 Categories: 2015 Drought, Instream Flows, Legislature, Salmon, Water Economics, Western Water Law, Whatcom | Permalink. The gates have closed at Post Falls dam to ensure that Lake Coeur d’Alene water levels are maintained for boaters. Meanwhile, flows have dropped nearly 2,000 cfs in the last 24 hours for the Spokane River. The theory is that redband trout fry have emerged from their redds, and so there is no impact on fish. These flows are fully controlled by Avista. Link here to watch Spokane River flows in real time, and pray for the river. Categories: 2015 Drought, Instream Flows, Spokane River | Permalink. This is Part 2 of a series on Whatcom Water Insanity, covering illegal use of water in the Nooksack River basin. See Part 1 here. See paragraph at bottom for two post-publication corrections. Just as California drought provides compelling lessons about the price – economic, social, and environmental – being paid for water mismanagement, we also have examples in Washington State. Whatcom County is notorious as one of the most lawless water basins in Washington State. 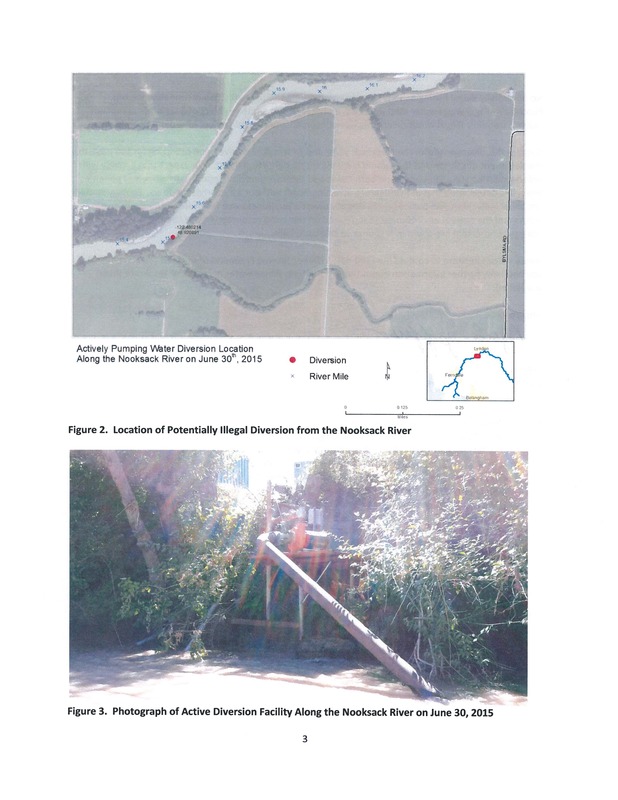 For years, illegal water diversions from the Nooksack River have been reported in articles, conference presentations, legislative testimony and more. And what’s crazy is that this illegal use has actually become an accepted modus operandi. Nevermind that diverting water without a permit is a misdemeanor, or that stealing water causes systemic harm to the environment, including endangered fisheries and water quality. Rather, there appears to be widespread agreement that illegal use of the waters of the Nooksack watershed is nothing more than business as usual. No one has done anything about it – until now. Unfortunately, what’s being done is dead wrong. The Department of Ecology has claimed (for years) that it lacks the resources to identify and enforce against unpermitted water use in Whatcom County. In 2013, the Lummi Nation decided to assist on the data collection side of the matter. Tribal staff floated the Nooksack River in the vicinity of Deming, Washington. GPS readings were taken wherever a water diversion pump was found, then compared with the state water rights database. Thirteen “unpermitted” users were identified. Lummi Nation staff provided their data to Ecology. Reasonable minds would expect Ecology to order these malefactors to cease pumping and pay penalties. This seems particularly important in the Nooksack basin, where a clear signal needs to be sent to end water thievery. But Ecology did not issue orders or penalties. Instead, Ecology has decided to reward the illegal diverters by giving them permits. Ecology has drafted a template to issue water rights to the Nooksack Nine. Click here to view it. This approach would be wrong in almost any circumstance, but it is particularly egregious given the condition of the Nooksack River. The illegal users will be required to curtail their use whenever Nooksack River flows drop below what’s required in the Nooksack Instream Flow Rule. As shown in the graph at right, during the irrigation season that happens between 50-75% of the time. To ensure that water users comply with the terms of their permits, ie, curtail their use 50-75% of the time, requires enforcement. But lack of resources is the very reason Ecology claims it cannot identify, much less stop, illegal water use in the Nooksack basin. How is it that Ecology now has the capability to police these permits? So, Ecology will actually get credit for issuing permits to the Nooksack illegal users. Even more problematic is that the illegal users will be taking water that is needed for fish. The instream flows established in the Nooksack Rule, adopted in 1985, are out of date and scientifically unsupported. 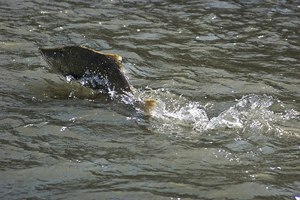 These rule-based flows, even when met, are not adequate to protect salmon and other species. Pursuant to the Nooksack (aka WRIA 1) watershed planning process, to which Ecology has contributed about $800,000, studies demonstrate that higher flows are needed for fish. The graph at right compares the appropriate biological flows (in green) with the flows set forth in the rule (in red). These flows are derived from studies that Ecology funded and concurred in. 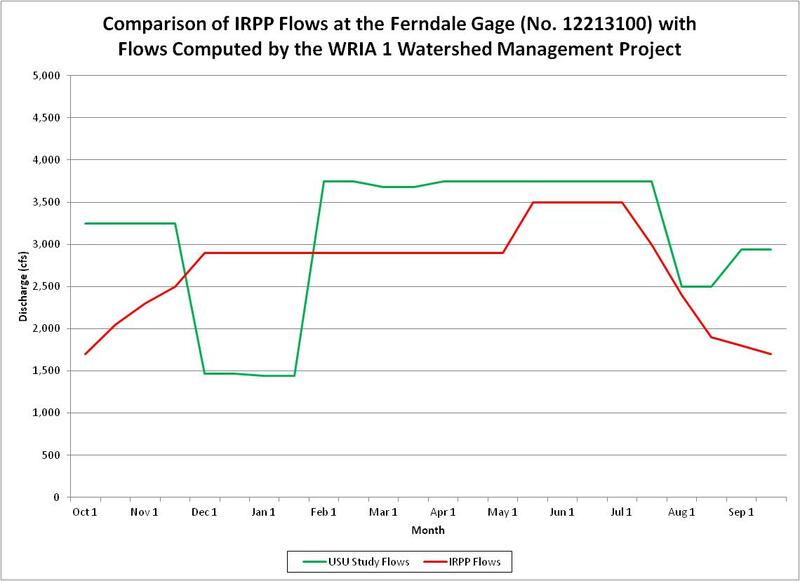 So why is the agency issuing new permits conditioned only on meeting the lower flows? The bottom line is that the Department of Ecology should not be issuing water rights that will drive the river toward the red line flow, and fail to preserve the ability to restore water to the green line flows. Ecology especially should not be issuing new water rights to scofflaws who for years have stolen the public’s water. This situation reveals the unseemly essence of Washington state water resource policy. Every drop of water that can be justified as available – even under the thinnest of pretexts — will be allocated for out-of-stream use. We see it not just in the Nooksack, but in river basins throughout the state. The state’s “water grab” policy — combined with exercise of unused municipal water rights, water thievery and waste, and the depleting impacts of drought and climate change — will destroy the public interest and values in Washington’s rivers. You don’t have to look to California to see the devastating consequences of a state mismanaging the public’s water. This is the second article in a series focusing on water resource issues in Whatcom County, Washington. Part 1 addresses the City of Lynden’s efforts to get the Legislature to change the law and “fix” its illegal usage. 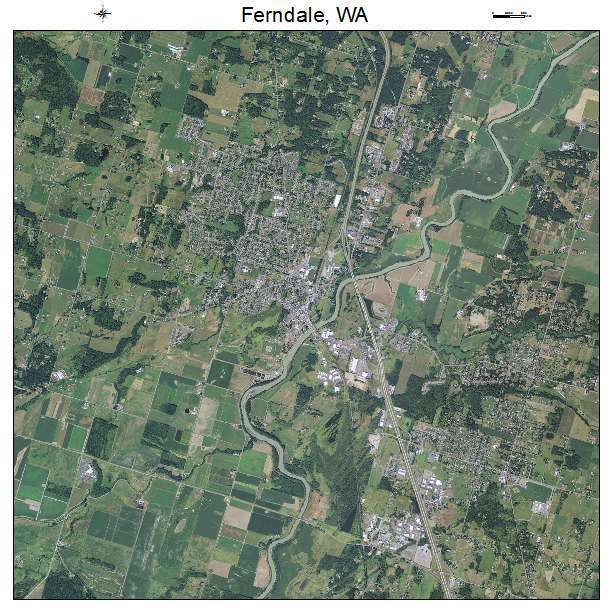 Readers should also check out the superlative water & land use blog, Get Whatcom Planning. We’ve made two corrections to this article since original publication. First, the tribal survey of illegal diversions occurred in the Deming reach of the Nooksack River (not the Ferndale reach). Second, the Department of Ecology contributed $800,000 toward watershed planning, not $2 million. The other $1.2 million has been spent on post-planning technical work and instream flow negotiations. Categories: Instream Flows, Nooksack River, Salmon, Western Water Law, Whatcom | Permalink.